Tate Modern has a history for big switches. 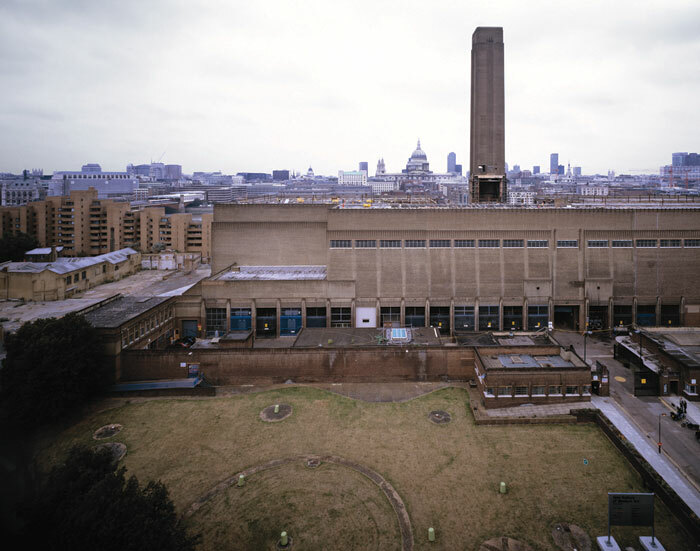 It switched a disused power station into the world’s most visited modern art gallery. It switched its once-deserted riverside location into a carnival of tourists. More than anywhere else, it switched on the global mass appeal of modern art. Now, with a new extension offering 60 per cent more accessible space and a 64m-high tower, comes a new switch. Form, elevation and interior spaces switch from the main building’s rectangular to the new-build’s angular. 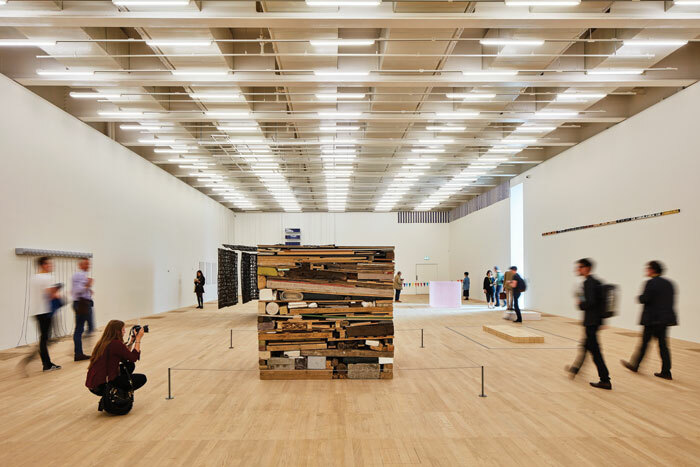 It is different, yet its materiality and monumentality clearly resonate with what came before. 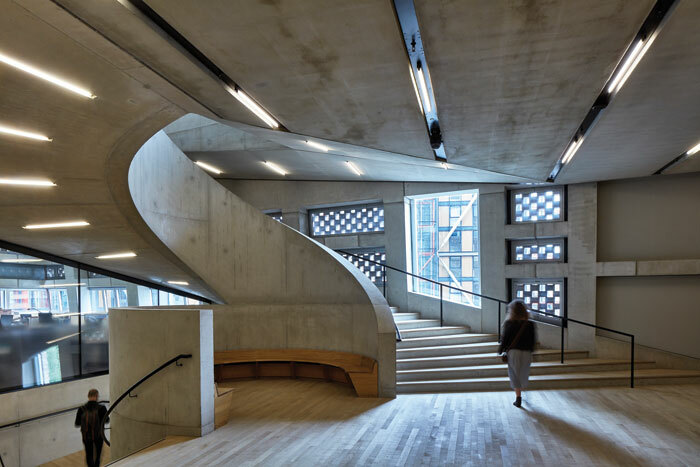 It’s hard to imagine that anyone but Herzog & de Meuron, the practice behind the Tate Modern born in 2000, could strike that balance between radical change and continuity. Its new extension is called the Switch House. The name is part of the heritage of Bankside Power Station (decommissioned in 1981), as is the Turbine Hall, the Boiler House galleries and facilities alongside it, and The Tanks, where oil was stored. Giles Gilbert Scott, who had designed Battersea Power Station (1929–55), was commissioned to design Bankside in 1947. His 200m-long, monumental, brick, art-deco structure, with its signature 99m-high central chimney, fired up its oil-burning generators in 1953. It included electrical switching houses on the southern Sumner Street side - massive volumes that continued the aesthetic of the adjoining main building. In 2005, EDF vacated the western half of its facilities (the other half is still feeding power to the City for UK Power Networks). 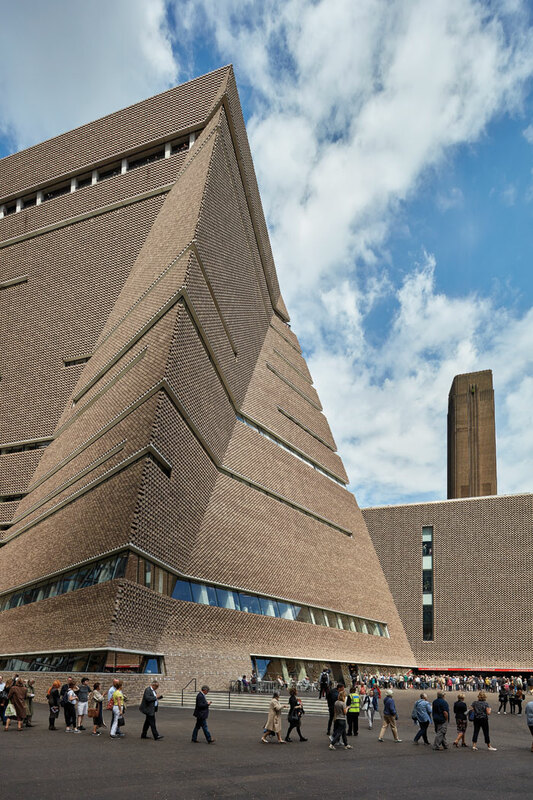 Tate Modern, then already attracting four million visitors a year - twice as many as initially projected - pounced on the vacant volume. 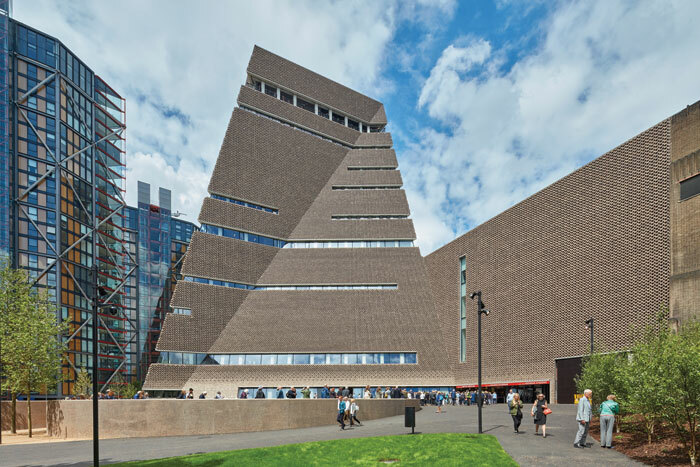 Herzog & de Meuron had already returned to Tate Modern to adapt The Tanks, once oil-storage facilities that opened as galleries in 2012. It started the Switch House design process in 2006. The vision was a tower form complementing rather than challenging the chimney, but it was originally like an icy glass mountain inset with transparent rectangular blocks. Jacques Herzog comments that ‘we would have been caught in all these boxes. We felt we were caught in a trap’. It reconsidered, approaching the old and new buildings as ‘one thing with different atmospheres, one organism’, he says. This is immediately visible in the Switch House exterior. The facades reference Scott’s ‘brick cathedral’ solidity and material, but space each of the 336,000 bricks to create a lattice. ‘The brick is not opaque, not so traditional... knitwear, almost,’ says Herzog. Yet from the exterior, the brick does look opaque by day, with a fabric-like texture. At night, its permeability allows light to shine out from inside. From the inside, the bricks filter the flux of daylight and dapple light across internal spaces. The contrast with the old and new brickwork is most legible on the south-face of Scott’s eastern switching house wall, the plane of which continues in the new-build. The switch between bricks is a clear vertical line aligned to the chimney on the north side. 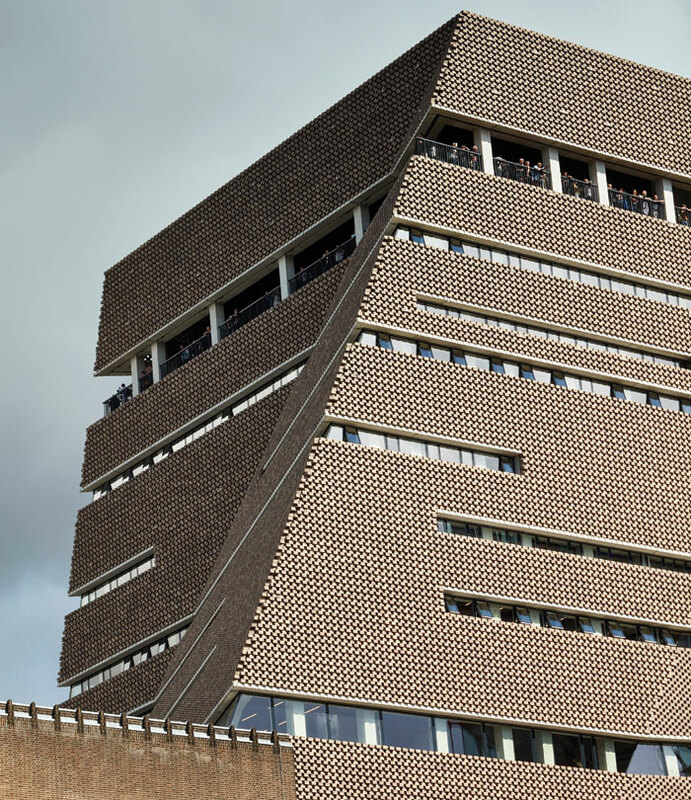 Herzog & de Meuron project director John O’Mara explains that the new brickwork is self-supporting, and calls it a ‘dynamic veil’. The tower volume is on the south-west corner, adjoining the new vertically walled section. Its form is a truncated asymmetric pyramid, fanning outward to the ground with facades transversally folded to create great inclined triangles. But Scott’s building remains the uppermost reference - the 64m-high roof is a square, aligned parallel to the great old building below. Windows band the facades horizontally, some continuous, others just part-way. The concrete over which the brickwork is mounted is clearly seen in columns peeping through some of these bands. 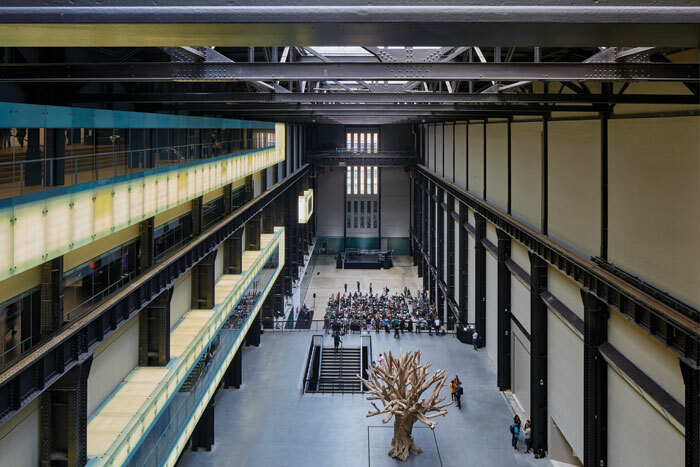 In an echo of Scott’s east and west-side vertical windows, including those at each end of the Turbine Hall, vertical window strips also cut into the Switch House. One climbs as high as the old power station’s roofline on the west side, another is set in the new southern vertical wall. Internally, concrete is the dominant material, from the base upwards. Accessing The Tanks off the Turbine Hall at Level 0, you see it in thick, inclined structural columns and within the circular spaces, whose old concrete walls remain untouched, there is now a grid frame of concrete. The Switch House is above, and lifts take you right to its top, at Level 10. Here, you step out into a double-height floor, under that square roof. 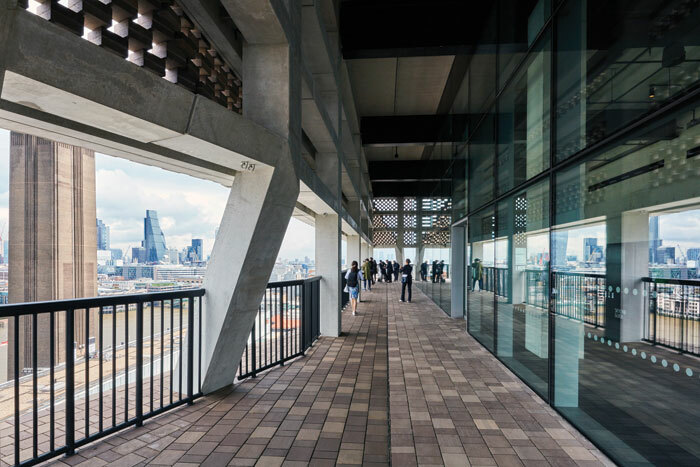 Its internal space is walled with glass; beyond is a loggia, offering a continuous, brick-paved viewing colonnade round all four sides within the building’s outer concrete frame and kinking out at corners. The brick veil is like a bris-soleil above and around it. The view is free and incredible, the Thames and the City skyscrapers behind Scott’s chimney to the north, Piano’s Shard to the east (which, like the Switch House, tapers with unexpected angles), and RSHP’s NEO Bankside apartments voyeuristically exposed to the south. Step back inside, and the floor is in the same wood as throughout the old Boiler House, and now on all the new floors below, another element of continuity. (In 2000, some said the boards wouldn’t last, but they have and, as de Meuron says, ‘you can always replace them’). On Level 10 there is only one internal feature - a 1m-high rectilinear concrete G-form, looking like a ridiculously simple maze. It introduces the stairs, and the only way is down. They cut narrowly between concrete walls to Level 9 containing the restaurant, then Level 8 with its new Members Room. Despite columns, these spaces feel open and are hung with LED lamps in glass bulbs and furnished by Jasper Morrison. Both have continuous windows, perimeter high-backed wooden bench seating below and a translucent screen made by the brick lattice above. Level 7 is a staff floor, Level 6 event space and Level 5 another clear floor for Tate Exchange, dedicated to learning and research. 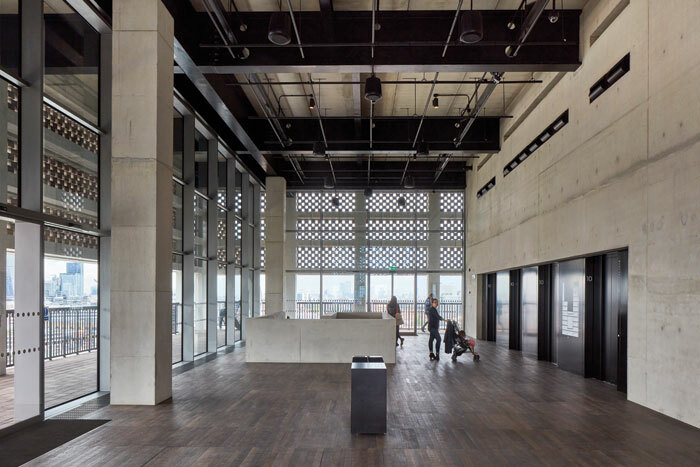 These upper floors are served by one lift bank, faced on each floor by a long concrete bench alongside the staircase. The steps change from wood to concrete below Level 6. The staircases, ‘carved out of the solid’, as Herzog says, are gradually breaking out of their concrete trenches as they descend. Openings allow you to peep out on upper floors, but the space is compressed. At Level 4, which is double-height and the highest floor with galleries, views from the stairs open up across lobby space. A second lift bank reaches here, opposite the first across a central lift lobby. 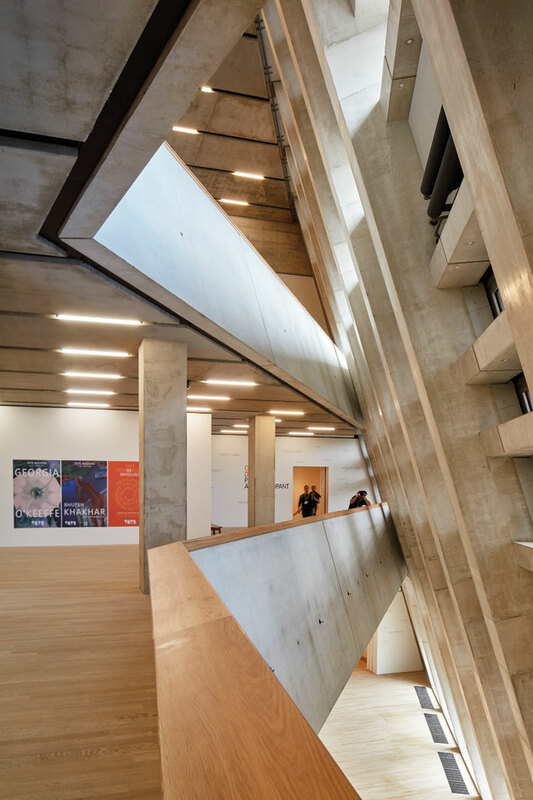 The circulation spaces have a dynamic spatiality with the angular staircases, extra light from a vertical window and a glimpse over the floor edge into a triangular wedge of void all the way down to Level 2. Another dramatic element at Level 4 is a new bridge that connects the Switch House to the Boiler House across the Turbine Hall, and, with circulation between them at ground level, creates a loop. The bridge is wide (‘we call this a vertical boulevard’ says de Meuron) and sloped slightly at each end to accommodate the different floor heights. Painted black, the bridge when seen from the floor far below is almost lost in the black steel frame of the Turbine Hall, and even echoes the gantry crane on Level 3. ‘It’s almost like it was already here,’ de Meuron comments. The Switch House galleries are the only air-conditioned spaces, and small ante-rooms act as buffers. They often feel like the old Tate Modern — not just because among the new there is familiar content, such as Louise Bourgeois, whose work fills Level 4’s Artist Rooms for a year, but because most are again white-walled rectangular spaces, and all have that wooden floor which, as de Meron comments, gives them ‘warmth and softness’. 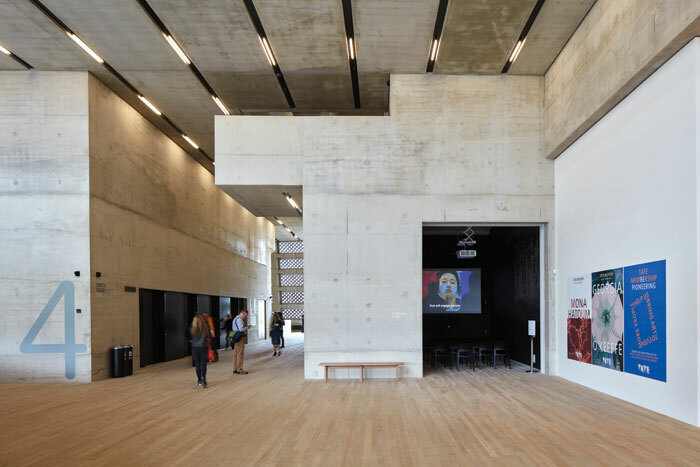 But room size varies, from smaller, square galleries to a veritable warehouse-sized space on Level 2, split in the middle by a non-structural wall with three openings you can pass through. 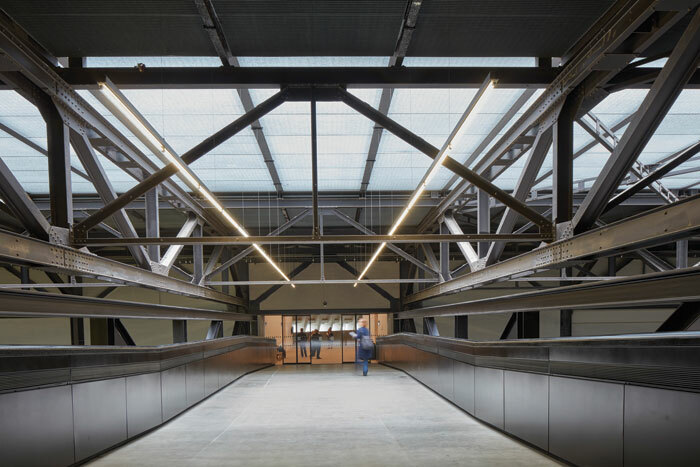 In the ceiling, beams and pipes are exposed above the level of strip lights. But the next gallery shows that shape, too, can change. It is bound by the inclined structural frame and exterior brickwork. On Level 2, an angular lobby’s ceiling is cut in an indent from the perimeter, revealing the terraces on Levels 3 and 4 above, which border the triangular void. It creates a cathedral- like sense of height. As elsewhere, acoustic panels cover horizontal sections of the perimeter wall and, as de Meuron comments, they also ‘reduce the mass’. Stairs continue to vary as we descend. Spiral stairs connect levels from 4 to 2, with three-quarter arcs of circular wooden bench at the landings. Below Level 2, stairs straighten sharply to shallow out and descend gently to the lobby on Level 1 with bar and shop. The shop has an industrial aesthetic with its original riveted steel columns and exposed ceiling services, all painted black, but within that it is flexible with vitrines, shelving and even sign holders all bespoke. 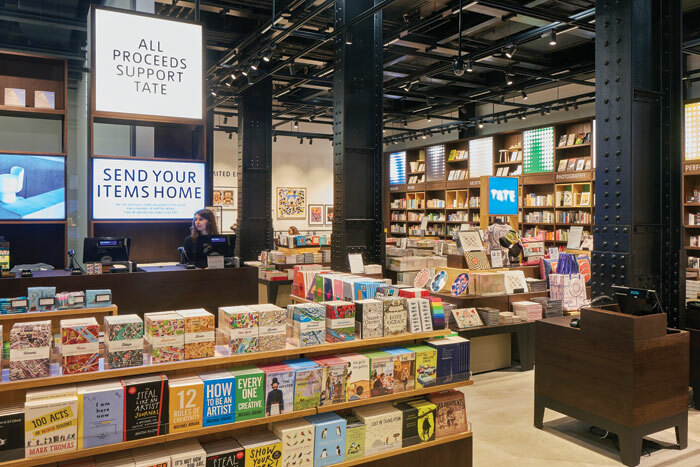 Amsterdam-based UXUS has fitted it out to be ‘consistent with the Tate experience’, as CEO George Gottl says. A standout feature is the light boxes at high level, whose display can be changed. Besides the shop there is one more turn of stairs, leading down to The Tanks in a concrete spiral, monumentally solid yet lyrical and graceful. A wide new Tate Modern entrance on Level 1 faces south, beneath the vertical wall beside the tower. 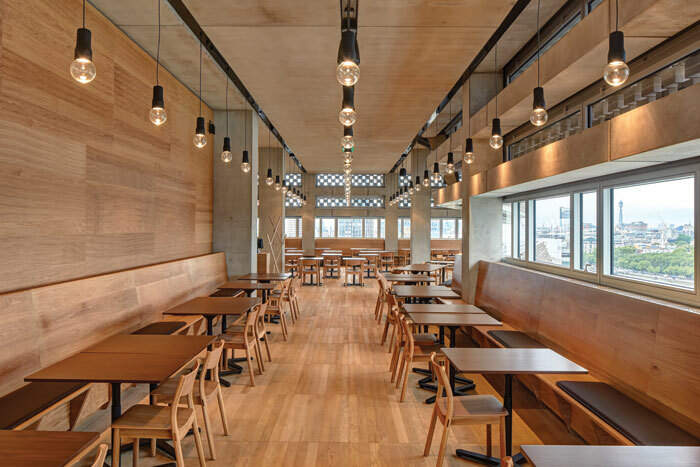 The Switch House is a not just a stunning addition to the Tate, but London as a whole. In a cityscape constantly sprouting iconic structures, standing out is simultaneously becoming more difficult and a game of diminishing returns, but the Switch House tower stands with gravity and flair. It is like a rebuttal to the glass towers visible in all directions from its viewing gallery. There are echoes of Herzog & de Meuron’s 44m-high Education Tower of de Young Museum in San Francisco (2005), which twists to align with the surrounding city grid and has a facade indented with those horizontal window strips. But by contrast the Switch House’s form is about triangles, and its brick veil gives it monumentality and extraordinary permeable texture. Internally the Switch House presents further adventures in geometry and textures, like a new brutalism. It plays a thoughtful game with movement, not least in those stairs that weave an ever-changing story over its full depth. The galleries are the least surprising, as they should be - they are there to show not architecture but art. 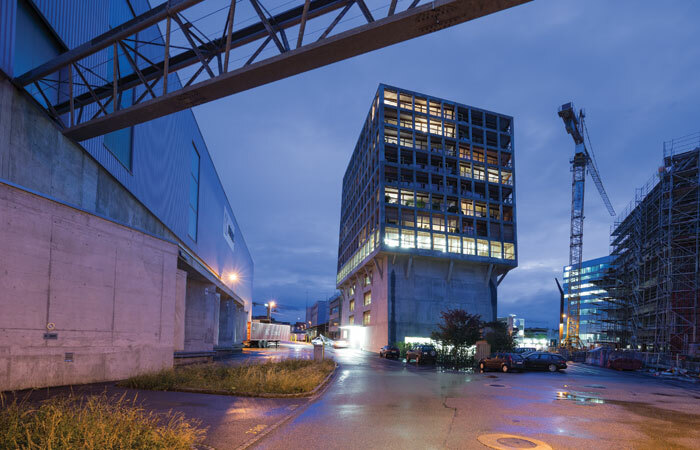 The era of starchitects may be passing, but Herzog & de Meuron transcends such issues, and the Switch House shows that it remains supreme master of its art, architecture itself.